Some goo, a nice brush, wads of fancy paper and a beautiful sunny day. Even better with tea and company. Really like the colour blue? 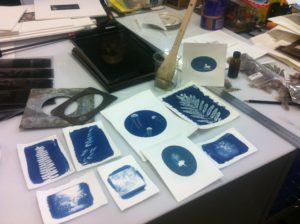 Come along to the Lab’s informal, totally suitable for beginners, let’s-eat-biscuits- and-make-stuff Sunday workshop and let us show you how to make Cyanotype prints using some fancy paper, some simple chemistry and the sun! 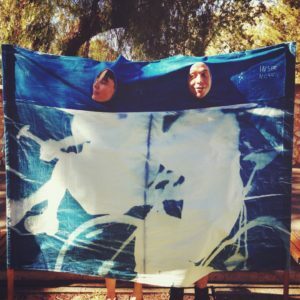 This very adaptable technique can be carried out at home without a darkroom and is suitable for school age children and adults alike. 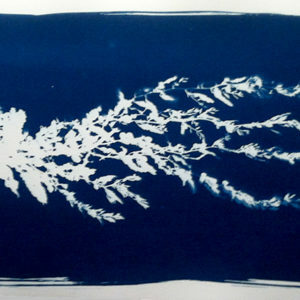 Print on paper or fabric, big or small. 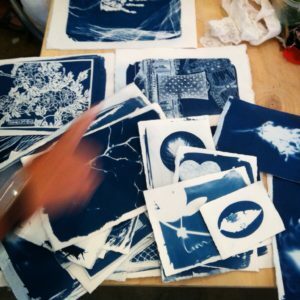 Bring a variety of flat(ish) objects or your large negatives to make beautiful, unique prints. We can provide some instruction on making suitable digital negatives if requested. We also offer Cyanotype Kits which include absolutely everything you need to continue making cyanotypes at home. Workshop participants are offered a $20 discount on the kit price. Workshop includes lunch, snacks and crazy amounts of inspiration. 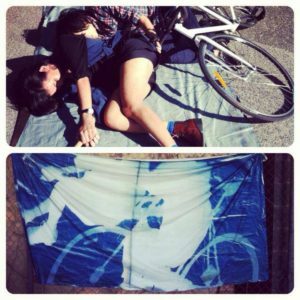 Mill residents Peter and Lillie getting involved in our cyanotype schemes. we weren’t the only nerds to get involved, but we might have been the only ones to photograph it.